The highway RV9 passes through many villages and the landscape varies from flat countryside to wild and beautiful mountains. Around every bend, in the 210-kilometre long valley, new vistas and activities await you. 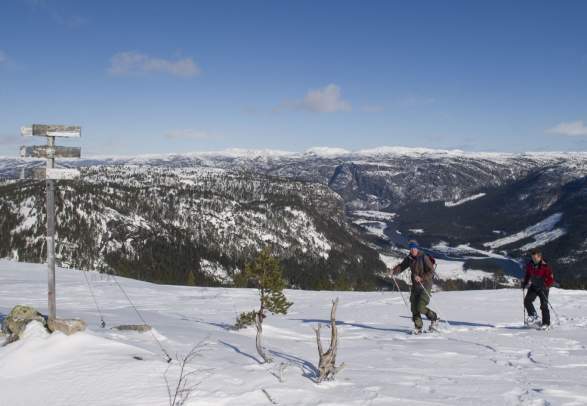 In the winter you can choose between two skiing destinations; Brokke and Hovden. In the Setesdal valley you will find living silver handicraft and traditional music. In the countryside or in exhibitions, you can see minerals from "the beginning of time". Iron production from the Viking Age, local building styles, art and handicraft are exhibited in the valley's museums. As you explore our impressive landscape, please show consideration for your surroundings for the benefit of future generations. Have a nice stay in the Setesdal. As a part of the process of making Setesdal a sustainable tourist destination, several charging stations for electric vehicles have been installed along the main road RV 9. The latest addition is the new, large car park in the centre of Hovden. Go rafting in the river Otra, find a nice beach in Bygland or splash around with the kids in Hovden Aqualand. Explore the climbing forest in Evje, the steep mountains and the new via ferrata in Valle or try activities such as mountain biking, go-karting or bowling. Enjoy the great outdoors - go fishing in the river or hike the beautiful mountains in Setesdal. The Setesdal valley has century-long traditions in the silversmith's craft and folk music.The beautiful minerals are of course, even older. The most recent attraction, however, is the elk park Elgtun in Bygland.